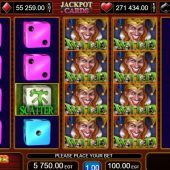 100 Super Dice slot tells you most of what you need to know in the title and that it will be a pretty basic game as is the similar 100 Super Hot from the same developer. A plain brown background and with the usual trotting sounds as we spin, but a slight change as we have a ringing sound as the reels stop, replacing the 'snick' one may have expected. There are some good animations at certain points though as we will soon discover, so will rolling these dice be a danger to our bankroll? As the name suggests we have 100 paying lines over the 5 reels of 4 rows each. All the icons are stacked bar the scatters but don't get your hopes up as we have no bonus round here! Your best pay is for the stacked Joker Wilds on all reels and these award 10x bet for 5-of-a-kind thus your top 1000x stake pay for a full screen. Yellow Dice pay 4x, Red or Blue 2x, Green Pink or Light Blue 1x for a full line. You do get a scatter as said, a white Mah Jong die with Chinese characters and these simply pay 5x bet for 3 in view, 20x for 4 or the second-highest 500x bet pay if you're lucky enough to see all 5. You do get some nice flame animations when the Wilds count in winning lines but there are no adjacent pays here or right-to-left ones either. So you spin and watch and wait; that's all there is to do!